Ildiko Szabo, Assistant Curator of the Cowan Tetrapod Collection at the Beaty Biodiversity Museum, is passionate about birds. We welcomed her to the Bloedel Conservatory as a special guest speaker for a Walk in the Tropics talk titled “A World of Feathers”. “Feathers are actually quite simple in structure: there is a centre strengthening shaft and on either side are the vanes or the feathery bits. When we look at the shape of the feather – one side versus the other – the ratio of width and narrowing, we can tell where on the bird it came from”. Primary, secondary and tertiary feathers were explained as well as growing and molting patterns in different types of birds. Ms. Szabo continued the fascinating discussion with coloration. The colours in feathers are formed in two different ways – either from pigments or from light refraction caused by the structure of the feather. In some cases feather colors are the result of a combination of pigment and structural colors. 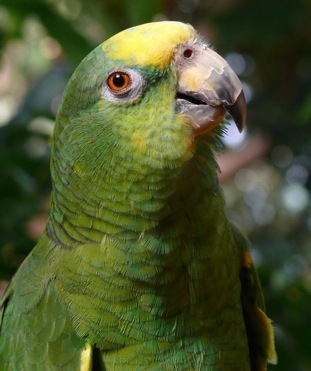 For example, the greens of some parrots are created by yellow pigments overlaying a blue-reflecting characteristic of the feathers, as can be seen on Casey the Amazon parrot pictured above. 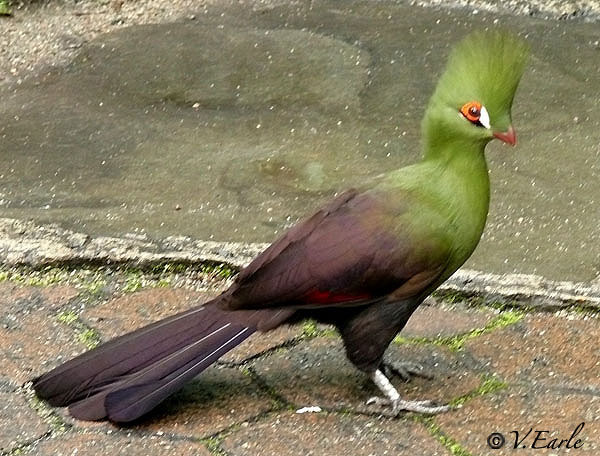 Pigment in birds comes from three different groups: melanins, carotenoids, and porphyrines. Melanins occur in both the skin and feathers of birds and can produce colors ranging from the darkest black to reddish browns and pale yellows. What’s really interesting is that feathers containing melanin are stronger and more resistant to wear and tear than feathers without it. White feathers – those without any pigmentation at all – are the weakest. Many otherwise all white birds have black feathers on their wings or black wingtips. The melanin that causes the tips to appear black also provides extra strength. 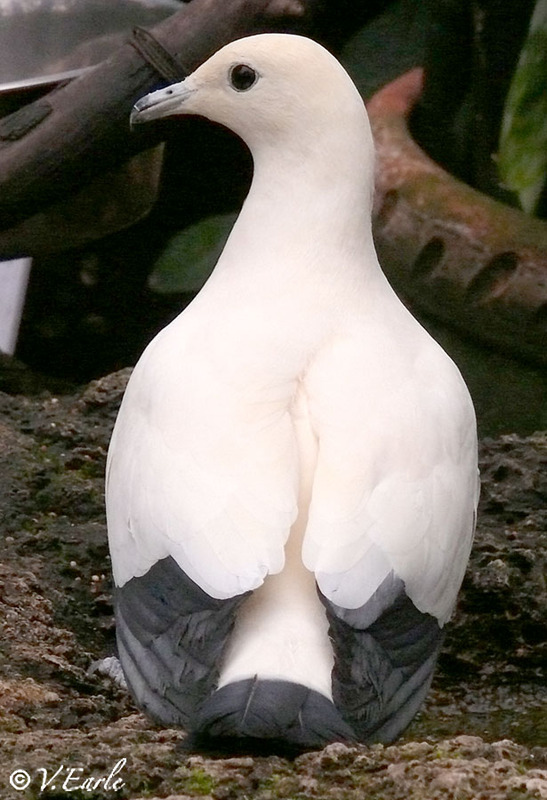 For example, the Pied Imperial or Torres Straight Pigeons, are powerful and agile flyers crossing large bodies of water between coastal islands, so very strong feathers are needed. Carotenoids are responsible for the bright yellows while porphyrins produce a range of colors, including pink, browns, reds, and greens. Porphyrins are found in some owls, pigeons and pheasants. They can also produce the brilliant greens and reds of touracos, like the one pictured below. Blue feathers, on the other hand, are almost always created by the structure of the feather rather than pigment. 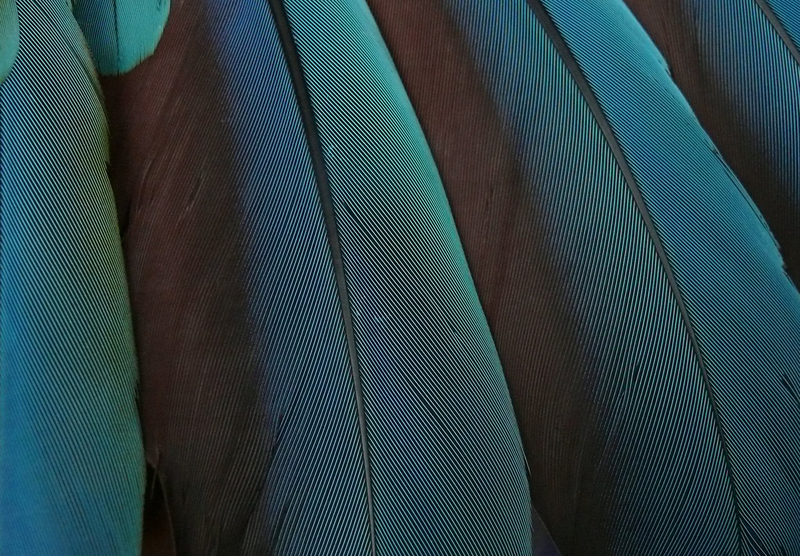 Tiny air pockets in the barbs of feathers can scatter incoming light, resulting in a specific, non-iridescent color. Special thanks again goes out to Ms. Szabo for an insightful and fascinating talk! The Beaty Biodiversity Museum is located at 2212 Main Mall, south of University Boulevard on the UBC Point Grey campus and is Vancouver’s natural history museum. Don’t miss the last Walk of the year! Be sure to mark your calendars for Sunday, November 17th at 11am for the next inspiring Walk in the Tropics “Since the Beginning of Bloedel”. Join Park Board Commissioner John Coupar on a historical tour of the Bloedel Conservatory. As the son of Bloedel’s first Garden Director, Charles Coupar, John will share stories and little known facts about the people, the mission, architecture, construction and development of Bloedel since it was built in 1969. Registration is a must! Visit bit.ly/1fmweyD for more information. 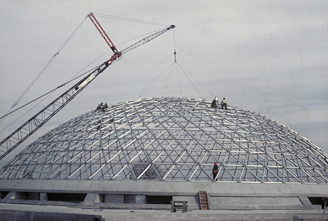 Bloedel Conservatory under construction in 1969.